Poetry is the soul of a civilised society and the celebration of poetry, a sign of its maturity. Purani Dilli Walo Ki Baatein is organizing a literary and cultural celebration with a flavour of authentic food of old Delhi curated by Sadaf Hussain MasterChef India 2016. The last three Dastarkhwan have seen a tremendous leap in the quality of our food and taste we have hosted and now we are coming again with the literary luminaries like Irfan Azmi , Shahrukh Abeer, Gayatri Mehta, Mohammed Sajid, and Shashibhushan Samad. The dastarkhwan is slated to be held on 16th February 2019 at Ballimaran, the neighbourhood of the great poet Mirza Ghalib. The sessions will be held at the Haveli at Punjabi Phatak, Ballimaran. There are hundreds of hotels and restaurants offering mouth-watering food in and around Delhi but all of them have western & modern style ambience. Somehow we have forgotten our old legacy of sitting on the floor and having food on lavish dastarkhwan in a mansion. Let’s introduce you to our age-old tehzeeb with our ‘Dawat-e-Dastarkhwan’. Haleem is a porridge like dish made from wheat, lentils and meat that has been slow-cooked for many hours. 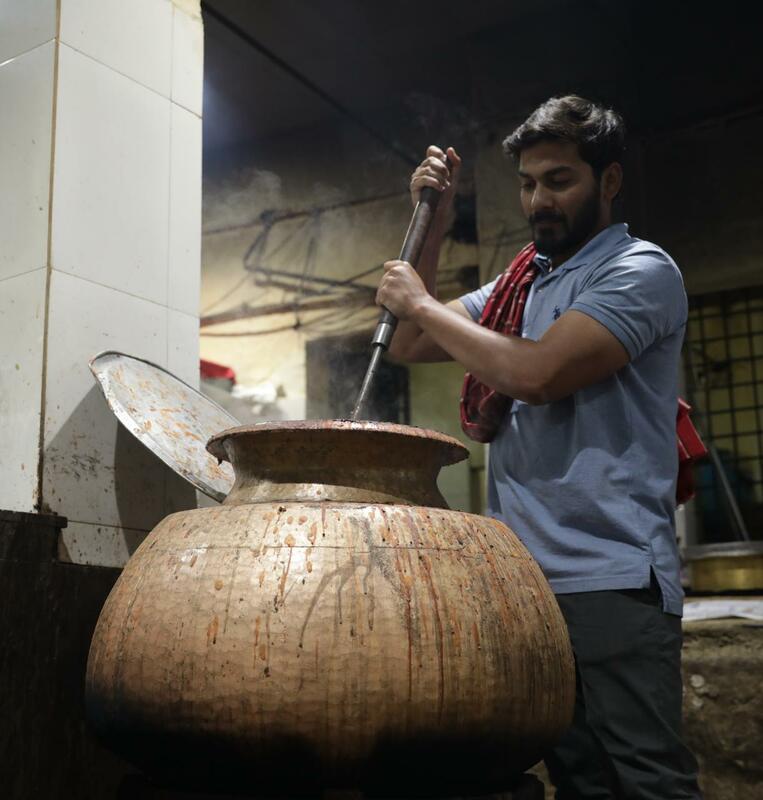 Haleem is not really a Delhi food—it has Persian roots. Dum Pukht means slow cooking in a sealed container. This popular cooking method goes back hundreds of years. It is almost always used to cook meat dishes and almost no water is added,so that the meat cooks in its own juices! Zarda Pulao is a delicious traditional North Indian yellow sweet rice recipe delicately flavoured with saffron, dry fruits, nuts and aromatic spices. Chicken mince cooked with green chillies, garlic, ginger, onions and yogurt. A nawabi delicacy which finds its origin in the Awadh and Rampur cusine and also have stayed back in Delhi with a few old Delhi walas. Prepared generally with minced red meat, boiled and then shallow fried with a filing of poppy seeds, fried onions and nuts which gives the texture of Fig (gular). Hamdard Rooh Afza Sharbat is a natural drink containing ingredients refresh and rejuvenate individuals during hot summers. Rooh Afza is a non-alcoholic concentrated squash which wasformulated by Naqi in 1906 in Ghaziabad, British India, and launched from Old Delhi. In India, chai is not just any beverage but a way of life. Chai is a way of life in India. Almost everywhere you go, you will see people gulping down the sweet, spicy, milky beverage. Although, Chai culture in India developed out of British colonization. Sadaf Hussain is consultant chef in Delhi and was one of the top MasterChef India contestants in 2016. He likes storytelling and passionate to explore background stories and origin of food and run a food website, www.foodandstreets.com. Sadaf is a TEDx speaker and has food shows on YouTube exploring street food and unexplored dishes. To register please pay Rs. 500 online via paytm or Google Pay ( on 96-43-533-224 ) payment link ( https://p-y.tm/ai-zlHi ) and Rs. 1000 on the spot. Kindly note: Online registration fee is non-refundable. Please send screenshot on whatsapp 9643533224 after payment. Ghalib Ki Haveli, Ballimaran, Old DelhiNearest Metro Station: Chawri Bazar & Chandni Chowk. Delhi 6 experience curated by Abu Sufiyan, Founder Purani Dilli Walo Ki Baatein, expert on creating walled city experiences. A walk through the lanes of Purani Dilli followed by sumptuous meal at 120 years old Haveli. Biryani, Haleem, Nehari, Kulcha, Mutanjan, Phirni all served lovingly by expert himself.